Adding sweet potatoes to your meal plan is a healthy way to aid in your weight loss effort. Sweet potatoes are nutritious starchy vegetables that help meet your body's daily carb allotment, and sweet potatoes are part of several commercial weight-loss diet plans. However, eating something healthy like sweet potatoes isn't a guarantee you'll slim down. 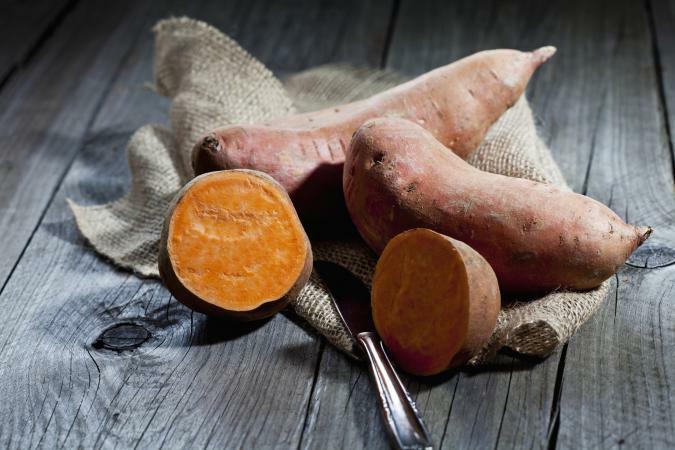 Do Sweet Potatoes Aid in Weight Loss? Eating sweet potatoes aids in weight loss only if you reduce your overall calorie intake (or boost calorie expenditure). Depending on the weight loss diet you're following, sweet potatoes may or may not fit into your meal plan. However, if you're eating a well-balanced, reduced-calorie diet, you'll need some starches (like potatoes or whole grains) to round out your plan and keep energy levels high. Because sweet potatoes are so high in carbs, don't count them as a vegetable in your weight loss meal plan (even though sweet potatoes are classified as veggies). So for example, try interchanging sweet potatoes with brown rice, quinoa, whole-grain pasta, or other whole grains, as all of these foods are rich in carbs. Use 1/2 cup of cooked sweet potatoes as a portion size, as this is the amount that's comparable to one serving of cooked grains. 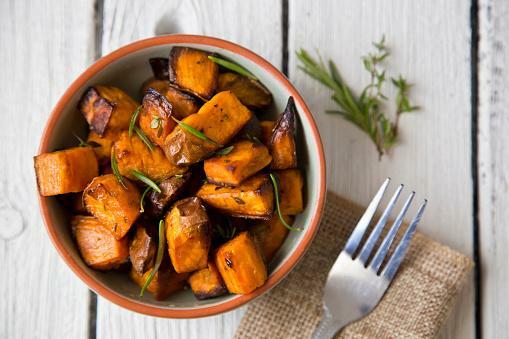 In 1/2 cup of cooked cubed sweet potatoes, you'll be getting 88 calories, 1.5 grams of protein, 20.5 grams of total carbs, 1.5 grams of dietary fiber, and lots of potassium and vitamin A. Similarly, 1/2 cup of cooked white potatoes provides about 82 calories, 2 grams of protein, 19 grams of total carbs, 2 grams of fiber, and more potassium than sweet potatoes (but a lot less vitamin A). All types of potatoes have a high glycemic index (GI), but sweet potatoes are much lower than white potatoes. For example, a baked Russet potato has a GI of 111, and a sweet potato has a GI of just 70, says Harvard Health Publishing. According to Mayo Clinic, GIs of 70 and above are classified as high -- which means potatoes cause blood sugar to increase rapidly (spike) instead of slow and steadily. MedlinePlus says following a low GI diet is beneficial for people with diabetes and may even aid in weight loss. Why is this the case? Healthy foods that are beneficial for slimming down are often higher in fiber or protein (or both), which helps boost satiety. For example, whole-grain bread (higher in protein and fiber than white bread) has a lower GI (51 vs. 75). Because calorie, macronutrient content, and glycemic index of sweet vs. white potatoes aren't drastically different, you likely won't notice a change in body weight after switching from white to sweet potatoes. Sweet potatoes do have a lower GI, but both sweet and white potatoes are classified as high-GI foods. The following diets associated with weight loss (or healthy weight maintenance) allow you to eat sweet potatoes, but there isn't a specified allotment for how much you can have: Paleo diet, Whole30 diet, and reduced calorie diets. Due to having a high GI, potatoes (even sweet potatoes) aren't included in glycemic index diets or low-carb diets. Lowering your calorie intake (while maintaining a well-balanced meal plan) is one of the best ways to safely and effectively slim down. Diets containing 1,200 calories daily for women and 1,500 calories per day for men often do the trick. Sweet potatoes can be included in this type of weight loss plan if desired, but sweet potatoes aren't necessary for weight loss. To add sweet potatoes to reduced-calorie weight loss plans, count them as a grain (since sweet potatoes are so high in carbs). The Dietary Guidelines for Americans 2020 suggest taking in 4 ounces of grains when following a 1,200-calorie diet, and 5 ounces of grains when eating 1,600 calories per day. You can easily substitute 1/2 cup of cooked sweet potatoes for 1/2 cup of cooked grains, such as rice, oatmeal, quinoa and whole-grain pasta. There are several ways to incorporate sweet potatoes into a weight loss diet. Bake sweet potatoes and sprinkle them with cinnamon. Make your own sweet potato fries by baking sweet potato strips in olive oil sprinkled with salt. Try a sweet potato soup recipe. Serve mashed sweet potatoes, but limit or omit fatty add-ins like butter or cream. Add cubed sweet potatoes to cold salads. Roast bite-sized sweet potatoes in olive oil and herbs of your choice. Sweet potatoes are loaded with vitamins and minerals, and keeping the skin on sweet potatoes is a good source of satiating fiber. Because whole grains are equally nutritious (containing vitamins, minerals and fiber), there isn't a clear advantage of choosing sweet potatoes over grains unless you enjoy the taste of sweet potatoes more. The bottom line is to limit your overall calorie (and carb) intake to recommended allotments, which vary based on the type of weight loss diet you choose.